Wake up to success with Yes to Success founder, bestselling author, speaker and pioneer, Debra Poneman. 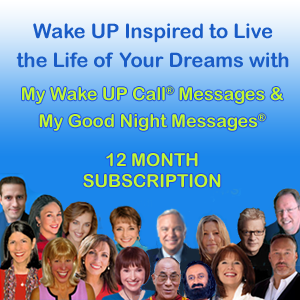 I am so grateful to have recorded My Wake UP Call to Success messages. I know that My Wake UP Call messages are helping to shift the planet and it is exciting! You know, when you start your day with negative messages, you carry that draining energy with you throughout your day. It not only negatively impacts you, it also affects the people around you. And when you start your day with these inspiring messages, you carry positive energy with you, which ripples out and uplifts others in your day. It’s a real gift for you, and for the people in your life! In the 1980’s, Debra happened upon the principle that your thoughts create your reality. Fascinated, she began studying the masters who lived and espoused this principle, now popularly called the Law of Attraction, such as Napoleon Hill, Wallace Wattles and Emmet Fox. Discovering that this concept was just the tip of the iceberg and knowing that the world could benefit from this knowledge, she translated it into the language of the time and founded her company Yes to Success. Within a few short years, Debra’s seminars were being taught in US cities from coast to coast and seven countries around the world. Among her clients were Fortune 500 companies and international associations. Among her students were people who went on to became successful entrepreneurs, leaders in business, New York Times best-selling authors, world-class athletes, millionaires and billionaires and household names. Then, with a book deal in hand, negotiations underway for her own TV talk show, and a contract pending with multi-national clients; true to her teaching, Debra gave it all up when she realized she had a greater passion. Over twenty-five years later, she’s back to share her story and her knowledge of how true and lasting success, prosperity and happiness are really created and to once again help people around the world know how magnificent they are and to say YES to true success. For more information on Debra’s live and on-line programs, go to www.YesToSuccess.com.